When I was young, my family raised and trained working dogs. We had young golden retrievers or German Shepherd dogs nearly every December. My mom was the BEST at defensive decorating, dog-proof style. Don’t get a large, tippy tree. A medium sized tree in a weighted stand adds stability. Put it up. One year when our puppies were really young, mom put a small tree up on a taller table so it was out of reach of grabby puppy faces. Gate it. Use an exercise pen as a fence to keep dogs away from the tree. No edibles on the tree. A friend had to take her Lab to the veterinary ER one Christmas because she decorated the tree with lovely handmade salt-dough decorations. The dog ate them all, including the metal hangers. Don’t put food products on your tree! No edible presents either. Just keep them on top of the refrigerator until Christmas morning and it’s time to open gifts. Trust me on this. Use unbreakable decorations up to tail height. That’s IF you have responsible dogs. If you have young, irresponsible puppies… well, you’d better simply forget glass ornaments this year! Holiday treats on coffee tables? Unless you’ve done some stellar training for this, please put the dogs on leash or in another room before setting out the artichoke dip and baklava on low tables. Aside from ruining your guests’ appetite with dog slobber covered plates, you can avoid a trip to the ER vet with your dog’s pancreatitis attack. Speaking of the ER, avoid toxic plants that dogs love to chew. This includes poinsettias, holly and mistletoe. Instead, decorate with roses, Christmas cactus and orchids, which are non-toxic. Dogs first. On Christmas morning, let your dogs open their own presents first! Leave off the ribbons and bows, and make sure they don’t eat the packaging. But you can encourage ripping and tearing by placing dog treats inside with the gifts. If you give frozen packed Kongs or other long-term chews, your dogs can open presents and remain happily occupied while everyone else opens their gifts. Set expectations. Check out our training classes to help your dog prepare! Take lots of photos. 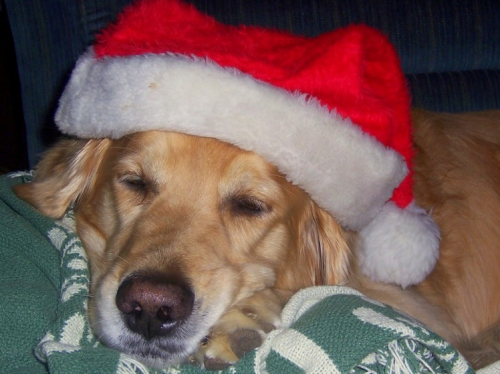 Dogs love Christmas too, and this is a great chance to capture the memories. Following these tips and tricks for holiday dog safety will mean a happier holiday season for both you and your four-legged friends. From all of us in the Willamette Humane Society Behavior Department, have a safe and happy holiday season!